The doctor’s news was grim. A rare cancer had caused three golf ball–sized tumors to grow in Eugene’s brain. There was no cure, and he had only a few months to live. In his memoir Chasing Daylight, published after his death, Eugene O’Kelley describes how he focused on his relationships during his last days. As a successful CEO of a $4 billion accounting firm, he had made his mark in the business world. Yet after receiving his diagnosis, he left the firm within two weeks. ­One night as he pondered his remaining time on earth, he sketched five concentric circles as a map of his relationships. He put his family’s names in the center circle and the names of other relationships in the outer circles. That night he committed to systematically spend quality time with each of these people, especially those in the inner circle. As I read this sobering story, I recalled attending an evangelism class taught by Dr. Oscar Thompson during my seminary days. He was also battling cancer, and he taught a similar concept he called concentric circles of concern, a way to think about those we know who need to hear the gospel. As we grow into adulthood, we often develop unhealthy relationship patterns. Many times, these patterns are rooted in our childhood experiences. Psychologists use the term attachment to describe the degree to which we feel secure, loved, and connected to others. Recent discoveries show that if we felt loved and securely attached to our parents as infants, we’ll most likely develop healthy relationship patterns as adults. If we didn’t, we’ve probably unconsciously developed unhealthy ways of relating to others. Research has shown, though, that a mindful lifestyle can improve our relationships by helping us become less self-focused. Have you ever talked with someone and then noticed that they hadn’t heard a thing you said? Or has your mind ever wandered in the middle of a conversation, as you rehearse what you plan to say in response? When you tuned back into the conversation, maybe you realized you had no idea what was just said. That has happened to me, and it’s quite embarrassing. A part of our brain activates when we’re thinking about ourselves or what others may be thinking about us. When that happens, we aren’t truly present for others. Perhaps that is why James instructs us to “be quick to listen, slow to speak” (1:19). The flip side of self-centeredness is “others-centeredness.” The apostle Paul wrote, “In humility value others above yourselves, not looking to your own interests but each of you to the interests of others” (Phil. 2:4). And others-centeredness is deeply rooted in how our brains process our thoughts and interactions. In Italy in the 1960s, neuroscientists accidentally discovered something interesting that they later called mirror neurons. In their lab, they noticed that when a monkey reached for a peanut, specific neurons in the monkey’s brain would fire. But they also discovered that those same neurons fired when the monkey simply observed the researchers reach for a peanut. In other words, the monkey’s brain reacted in the same way whether it had actually reached for the food or was merely observing the behavior of the researchers. Thus these neurons, also discovered in human brains, got the name mirror neurons. These same brain cells affect our relationships. They form part of a brain circuit that helps us relationally resonate with people. We sense the emotions of others, and at the same time, we feel those same emotions in ourselves. It’s like when someone tears up as they share a personal story, we also tend to tear up as we feel their emotion. Holy noticing engages mirror neurons by helping us take the focus off ourselves, thereby improving our ability to pay attention to the nonverbal body nuances and facial cues in others while at the same time decreasing own emotional biases. We read between the lines better. We see things more as they are and tune in better to the needs of others. Of course, an over- or under-sensitive mind can certainly misconstrue these subtle signals, so be sure to practice good communication skills so that you can confirm (or deny) what you are sensing between the lines. A holy-noticing lifestyle helps us, under the guidance of the Holy Spirit, be better noticers as we more accurately sense other people’s inner world. Holy noticing increases our empathy for others. Empathy includes three components: (1) understanding the thoughts of others, (2) feeling the emotions of others, and (3) acting to help others in need. The Bible commands us to show empathy in Romans 12:15: “Rejoice with those who rejoice; mourn with those who mourn.” And the Scriptures repeatedly command us to help others in need, such as the poor, orphans, and widows, which involves the acting component of empathy. Like a neural alarm, holy noticing activates our empathy circuits and creates a compassion brain wave that motivates us to help alleviate suffering. People with such a lifestyle are described as warm and in touch with the sufferings and joys of others. Sometimes we can become overwhelmed with other people’s suffering. One study, however, found that practices in holy noticing not only created more compassion for hurting people but also generated positive feelings and more resilience needed to be able to respond to those needs. Empathy even releases several feel-good brain chemicals, which makes empathy a pleasurable experience we want to repeat. A mindful lifestyle, rather than being self-indulgent, makes us more sensitive to the emotions and pain of others and increases the likelihood we will do something to relieve their suffering. This lifestyle develops more satisfying relationships as it fosters greater flexibility when we must deal with friction in those relationships. Even just a few minutes of daily practice can enhance temporary mood and improve social connection. When couples apply it to relationships, it increases empathy toward each other, lowers stress brought on by conflict, and makes them less liable to withdraw in times of conflict. Again, remember that the Holy Spirit is the ultimate change agent, and science only confirms how spiritual disciplines affect us. One expert believes that one of our human senses is relational, a sense that makes us feel connected to others. He describes it as “being felt” by others, what the Bible calls community (see Acts 2:42–47). Holy noticing enhances skills that foster community. 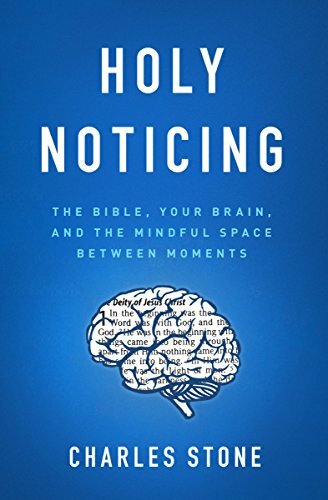 Excerpted from Holy Noticing: The Bible, Your Brain, and the Mindful Space Between Moments by Charles Stone (©2019). Published by Moody Publishers. Used by permission.